The biggest problem for the application of wavefunction-based quantum chemical ab initio methods is the calculation of the electronic correlation energy. Advanced methods such as coupled-cluster theory using iterative single and double excitations as well as perturbative triple excitations [CCSD(T)] are able to achieve an accuracy of ± 5 kJ/mol (‘chemical accuracy’) for small molecular systems, but become too time-consuming for routine applications to larger systems containing twenty or more heavy atoms. We propose a heuristic approach for a rapid estimate of correlation energies for larger molecules, based on parametrized pair correlation energies (PCEs) for localized molecular orbitals. Such PCEs were calculated for a training set of 112 small- and medium-sized neutral molecules from the G2/97 data set, using an approximate coupled-cluster method with single and double excitations (CCSD) and a basis set of quadruple zeta quality (def2-QZVP). The PCEs were then fitted to appropriate functional forms, taking into account the properties of the localized orbitals: type (lone pair, single bond, multiple bond), bond length, hybridization of the atoms involved in the bond, spatial extent, and distance between two orbitals. 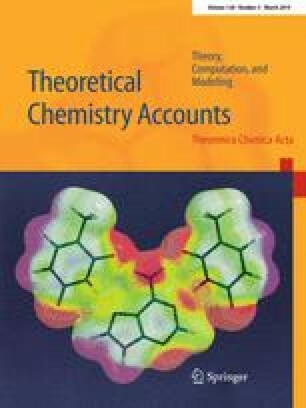 The ab initio results for the total correlation energies of the molecules in the training set could be reproduced within 1%. For most of the molecules in an extended test set containing also molecular ions a slightly lower accuracy of about 1% to 3% could be obtained. The online version of this article ( https://doi.org/10.1007/s00214-019-2422-5) contains supplementary material, which is available to authorized users.